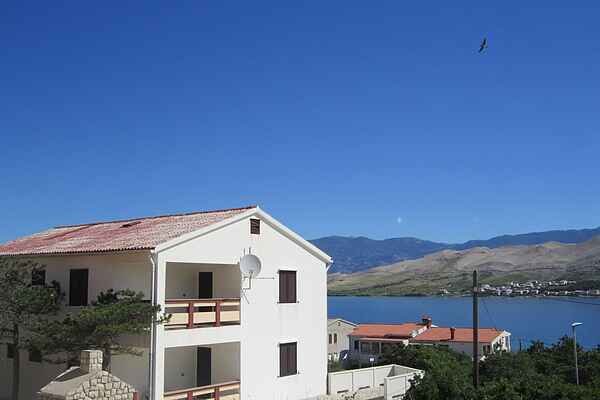 This spacious house apartment with terrace and sea view and beatiful garden with BBQ for use is situated in town Pag. Accommodation is just 300meters far away from beach and it is suitable for group of people or family. The town of Pag have a rich offer of the ancient monuments, culinary delights and an entirely different nature with magically beautiful stone scenery. At first glance the Island of Pag is a rough, stone made, edged with sky-blue sea and placed under the wing of the Velebit Mountain.The beauty of the landscape and the variety of the tracks for the bikers will satisfy every person in want of an active vacation. The combination of cycling, swimming, diving, windsurfing and rock-climbing will not leave anyone indifferent. Only 5 or 10 km away from a town Pag, you will find yourself surrounded by untouched nature.